With tax season upon us, it’s time to look at last year’s numbers. Are you concerned about your small business’s sales? If so, you’re not alone. Research has shown that 35% of salespeople think closing sales is getting harder, and 71% of companies say closing more sales is a top priority. To be clear: this doesn’t mean your sales reps should aggressively pursue every lead they encounter. In order to make this your best sales year ever, the key is to work smarter, not harder. 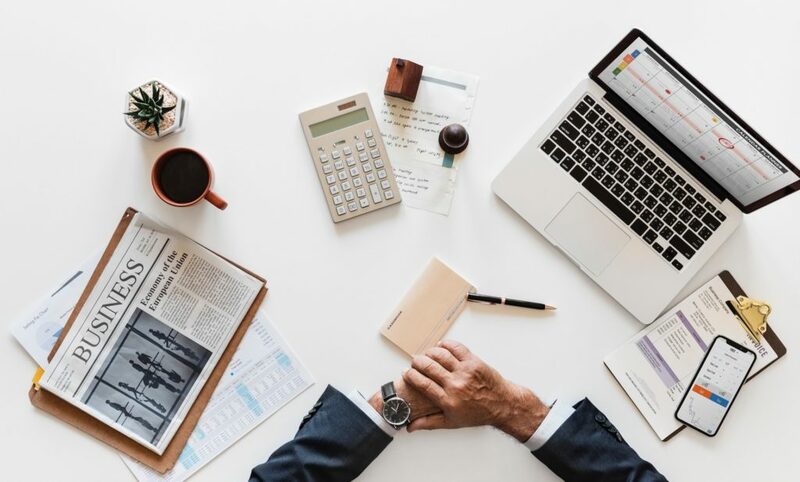 In this article, we’ll cover 5 strategies to help small business sales reps close more deals, plus tips on how to leverage your QuickBooks-integrated CRM to make the process even simpler. Imagine if someone showed up at your door out of the blue and tried to sell you something, with no greeting or preamble. You would feel pretty put off by that approach, right? The same logic applies when interacting with a prospective customer. Avoid jumping right into a prepared sales pitch that paints your solution as the be-all and end-all. Instead, initiate a conversation with your lead. Ask questions to learn more about their goals, their struggles, and what brought them to your company. By taking steps to build a relationship, you can determine whether your offerings are truly a good match for their needs. Your lead will also feel more comfortable doing business with someone who isn’t pressuring them to buy. Method:CRM users: Frequent communication is a big part of building relationships with potential customers. The Method mobile app makes it easy to stay connected and view lead data when you’re on the go. 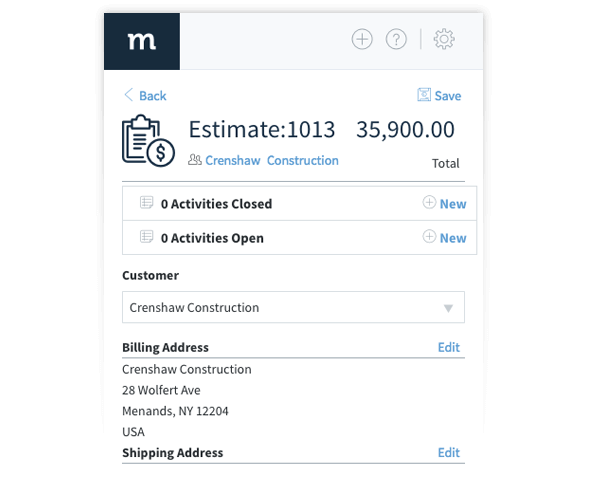 You can even prepare an estimate directly from the app, without needing access to QuickBooks. As much as we wish that every sales opportunity could lead to a sale, that usually isn’t the case. Sometimes you have to accept that an opportunity isn’t that promising. Maybe the lead doesn’t really need your product or service, or they don’t have the budget for it, or they’re just not calling you back — the reasons go on and on. That’s why proper opportunity management is so important. By taking a step back to evaluate your sales pipeline as a whole, you can identify and focus on the deals you’re most likely to win. As a result, the process of closing sales will become much more efficient. 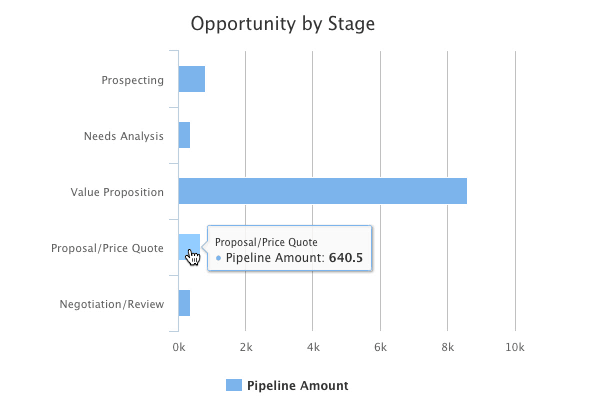 Method:CRM users: Use the “Opportunity by Stage” chart to easily identify which opportunities are in the later stages of the sales process. No matter how wonderful your product or service is, chances are your potential customers will have some concerns about it. Don’t be caught off guard when these objections arise. Instead, work with your team ahead of time to brainstorm a list of common objections, plus strategies to dispel them. For example, employees at a marketing agency could prepare a unified stance to address clients’ concerns about maintaining their brand voice. When you can confidently address every challenge your prospect brings up, they’ll be more willing to continue the sales conversation. 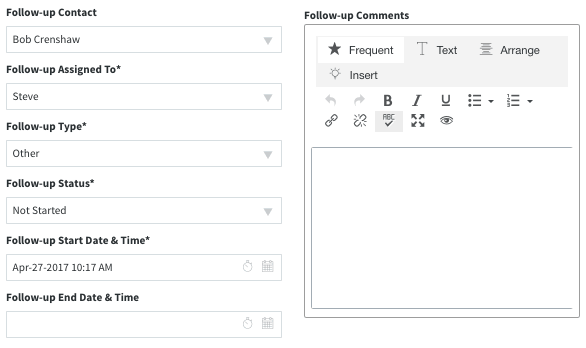 Method:CRM users: Save time when emailing leads by creating a custom email template that outlines your company’s responses to common objections. Don’t be tricked into thinking that if a lead is interested, they’ll keep the ball rolling. You are responsible for maintaining the momentum of the sales process. Each time you complete a step, make sure you you know what your next move will be. This may be the next step in a well-defined sales strategy (for instance, an agency account manager may typically call a potential client the day after a pitch presentation), or it may be something more context-specific. In either case, planning and scheduling your next step ensures that you keep moving towards your goal of closing the deal. Method:CRM users: Stay organized by scheduling a follow-up activity that is linked to a completed activity. Not only will the follow-up appear on your calendar, but it will display the notes from the completed activity. After overcoming your lead’s objections and convincing them of the value of your product or service, there comes a point where you have to ask for the sale. This may seem obvious, but sometimes salespeople are afraid to be direct because they’re worried about being rejected. Luckily, there are effective sales closing techniques, such as the “assumptive close” where begin the sales cycle assuming the prospect will buy from you and you subtly let your prospect know you’re assuming they’ll become a customer. Try different approaches and closing phrases until you find what feels natural to you. Method:CRM users: After you close the deal, convert your lead to a customer by editing the lead details and unchecking the ‘lead status’ checkbox. The new customer will automatically sync to QuickBooks, along with any transactions already created for them in Method. Like any skill, closing the deal requires practice and persistence. But with these tips under your belt, along with the power of a QuickBooks-integrated CRM, you’ll be well on your way to closing sales left and right. Sign up for your free trial of Method:CRM today!